As Charlie Whittingham used to say, “We've got 'em surrounded.” So it was for trainer Peter Miller Saturday at Santa Anita, as his upstart Conquest Tsunami scored a 2 ½ length upset in the Grade III, $150,000 Daytona Stakes, thereby heading a 1-2-3 finish for Miller that included Stormy Liberal and Calculator. Ridden by Victor Espinoza, Conquest Tsunami led gate to wire en route to getting 6 ½ furlongs down the hillside turf course in 1:12.03. 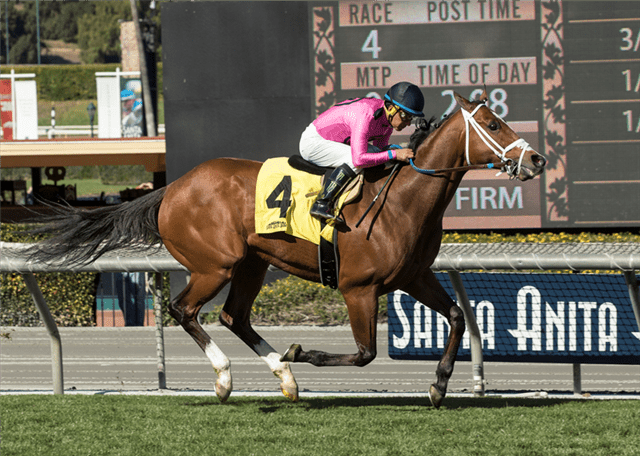 “There was just one way to go,” said Espinoza, who was aboard the 6-year-old Stormy Atlantic gelding for the first time. “I broke in front and kept my position all the way to the wire. For him the main thing is to let him go and just run his race. I felt he was going pretty quick but he was doing it so easily, so I was pretty much a passenger. A scintillating allowance winner in his first start for Miller coming down the hill on Jan. 20, Conquest Tsunami registered his first graded stakes win in today's Daytona. Off at 5-1 in a field of seven older horses, he paid $12.40, $5.80 and $3.20. Owned by Gary Barber and headquartered at Woodbine Race Course with trainer Mark Casse prior to joining Miller's barn in December, Conquest Tsunami improved his overall record to 22-8-2-2. The winner's share of $90,000 increased his earnings to $503,066. A winner of the Grade I Breeders' Cup Turf Sprint two starts back on Nov. 4, Stormy Liberal, who had two horses beat after the first quarter mile, was the narrow second choice at 9-5 and paid $3.60 and $2.40 while finishing 1 ¼ lengths in front of Calculator. Ridden by Flavien Prat, recent restricted stakes winner Calculator was the actual post time favorite at 9-5 and paid $2.40 to show while finishing 2 ¼ lengths in front of Tombelaine. Fractions, all set by the winner, were 21.99, 44.09 and 1:06.14. This entry was posted in NL Article, Racing and tagged charlie whittingham, conquest tsunami, daytona, Daytona Stakes, gary barber, Mark Casse, Peter Miller, santa anita, santa anita park, stormy liberal, Victor Espinoza by Mike Willman/Santa Anita. Bookmark the permalink.